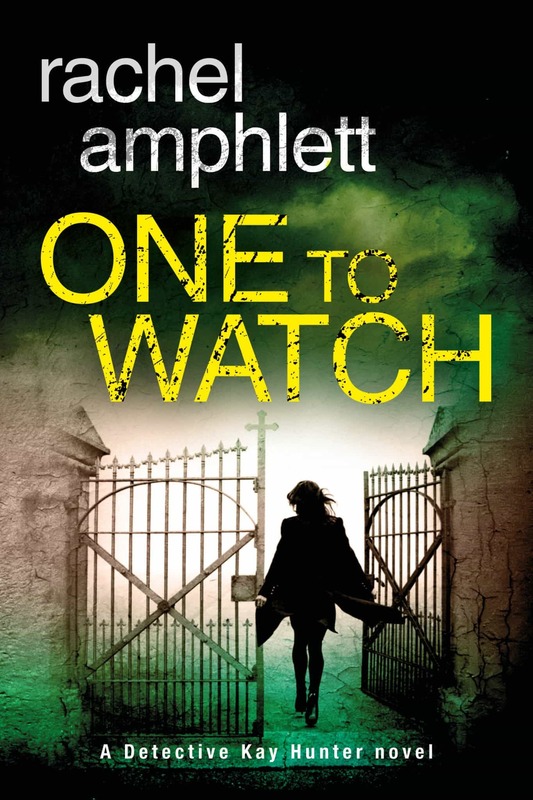 I’m very pleased to help kick off the One To Watch blog tour today by the lovely Rachel Amphlett, not only does she have a great name (Rachel!) but she is the amazing author behind the Detective Kay Hunter series. 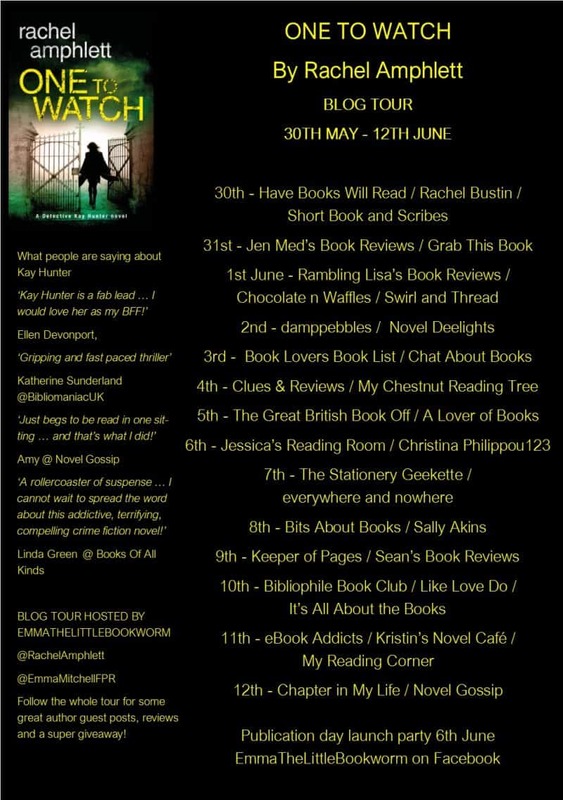 Read on for a fantastic extract from the new Kay Hunter novel. Eva Shepparton cried out once, her voice swallowed by the music and loud voices that emanated from the white marquee at the top half of the garden, and flung out her hands to keep her balance. She steadied herself, cursed the damp grass from the morning’s rain shower and stood with her hands on her hips, breathing hard while she glared back up the slope towards the party. In hindsight, she should’ve asked where the toilet was – or water closet, as Sophie’s mother would have insisted – except she couldn’t bring herself to approach the officious woman, or her husband. Sophie was nowhere to be found – Eva hadn’t seen her since the speeches, so instead, she’d decided that the thicket of rhododendron bushes would have to do instead. She sighed. If it weren’t for the fact that Sophie was such a good friend, she’d never have agreed to be here in the first place. The sweet scent of freshly mown grass filled the air around her, whilst smoke from the flaming braziers set around the edges of the garden wafted over her head. She’d seen the gardeners when they had turned up that morning, followed half an hour later by the florist. Between them, they’d pruned and plucked the garden to within an inch of its life. They’d finished moments before the marquee hire company truck had arrived. Now, the large white tent took up most of the lawn space, its timber flooring echoing the footsteps of a crowd of enthusiastic dancers. Eva’s ears still rang from the noise of the disco. The roof of the marquee swam with multi-coloured lights from a gantry set up above the DJ’s booth, and she could hear him now, encouraging the older members of the group to get up and dance to a Seventies disco hit. She held up her hand and squinted at her watch face, tilting it until the faint light from the braziers shone on the dials. She snorted. No wonder everyone was drunk. ‘For a bunch of devout Christians, you sure do know how to knock back the drink,’ she slurred, then hiccupped. She covered her mouth and giggled. Sophie had told her that the pastor of the small private church group she and her parents belonged to had suggested the ceremony be held at the church after hours; however, Sophie’s mother had poured scorn on that idea. The religious man had shuffled in his chair, blushed, and conceded the point. The next logical step had been for Sophie’s mother to offer the use of her own home. When Sophie had told her, she’d hidden her immediate reaction from her best friend, but couldn’t contain her disgust when she’d returned home, venting her frustration at her mother instead. Now, Eva gazed up at the house, its imposing outline towering over the marquee below. Sophie had told her the original house had been built in the Regency era, with subsequent owners adding and extending its footprint over the years. Eva shook her head, and wondered why on earth a family with one child would want such a huge property, before she giggled again, then hiccupped. Of course, Sophie’s mother loved the prestige that came with it, and the title. She sighed. The ceremony had been okay, she supposed, but fun? Diane had spent most of the time holding a handkerchief to her face, dabbing at her eyes. Sophie, of course, looked gorgeous. Her mother had arranged for a hairdresser and make-up artist to attend to her daughter’s every need, although Eva strongly suspected it was more to do with Diane wanting to keep up appearances than for Sophie’s benefit. Eva had made her way down the hallway to the spare room she’d been allocated for the weekend and had spent the time before the party changing into the dress she’d bought especially for the event and doing the best she could with her thick wavy hair, which had taken on a life of its own over the summer. When she had returned downstairs, the other party guests were starting to arrive, spilling across the hallway, through the substantial living area and out through French doors to the patio beyond. Caterers had appeared in Eva’s absence, and she’d wandered along the tables of food with Sophie, picking at canapés and clutching a glass of champagne while making small talk with the other guests. Josh Hamilton had turned up with his parents an hour later. Eva had to admit, he wasn’t bad looking at the best of times and tonight, he shone. Josh charmed complete strangers with the ease of someone used to being the centre of attention, shaking hands with the men and making small talk with the women, working the small crowd while his father, Blake, grinned as he draped his arm around his wife’s shoulders, their American accents cutting through the gathering of well-wishers. She had no idea what would happen tomorrow, once Sophie’s secret was revealed. Because it would have to be, wouldn’t it? Of course, by then it would be too late. Everything Sophie had set in motion would culminate in the events of this evening. She wished, in hindsight, Sophie had never told her. It would have been easier that way. The music paused for a brief moment, and the sound of the stream at the bottom of the hill reached her ears. The urge to pee dragged Eva from her thoughts, and she tottered towards the rhododendron bushes at the bottom of the slope. Her foot slid out from under her again, and she swore under her breath. Checking over her shoulder, she could still see the tops of some of the guests’ heads, the ones who had ventured away from the marquee to smoke cigarettes, and there was no way she was peeing within sight of someone. The ground began to level out, and Eva spotted a large rhododendron to her right. She hiccupped, then groaned as she stepped into a large puddle left by the morning’s rainfall. ‘I’m having one more glass of champagne, then I’m calling it a night,’ she muttered as she squatted behind the shrub. She sighed with relief, and then straightened and tried to wipe as much of the muddy water off her sandals as she could, swearing as she recalled she hadn’t even paid her credit card bill yet, and here she was with damaged shoes that she’d only purchased a week ago. Eva sighed, and resolving to leave as soon as possible, she turned to make her way back up the slope, and stopped. At first, she couldn’t work out what she was seeing. A form lay stretched out behind one of the other rhododendron bushes several paces away from her position. Only the legs were visible, white and unmoving. She swallowed, and moved closer, squinting in the poor light. It looked like a person, and as she wobbled her way towards it, she recognised the skirt of the dress. Concerned, she quickened her pace. She’d done a first aid course at school, and knew that if someone had passed out, you were meant to check their airway and then put them in the recovery position. If Sophie had passed out drunk, then she needed help. As she rounded the corner of the shrub, she gasped. Her best friend lay motionless, a dark splattered pattern now strewn across her new dress, her body twisted at an impossible angle where she’d fallen, one leg tangled behind the other and her face turned away from where Eva stood. She moved around her friend, fighting down the urge to panic. If her friend needed first aid, she had to keep calm. As she stepped over Sophie’s feet to crouch down next to her, she stopped. Sophie’s eyes were wide open in terror, a thick trickle of the same dark splatter covering her cheek, a gaping recess where her nose had splintered into her face. Here are the other bloggers on the One To Watch tour over the next couple of weeks. I hope this extract has you intrigued! You can buy One To Watch over at Amazon.